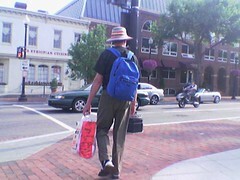 Random crazy guy wandering up Penn Ave to Georgetown, talking and loudly whooping to himself and occasionally gesticulating with his free hand. The scary part is that he followed me into CVS. Just lost him. How odd. We have a town rambly-chase-you-everywhere type as well. I was stopped near CVS yesterday and he walked by car and did a loud whoop too!